Zacka Gerald Chan drives an EK-generation Civic VTi-R in Australia. This is the Australian version of the EK4 Civic SiR but uses the 160ps export version of the B16A engine. One of the first thing Zacka did to fine-tune his car is to change the air-filter. 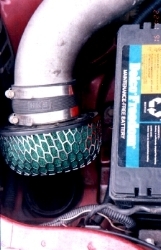 Being the simplest and often one of the cheapest to modify, air-filter mods are perhaps the most popular and usually one of the first to be done. 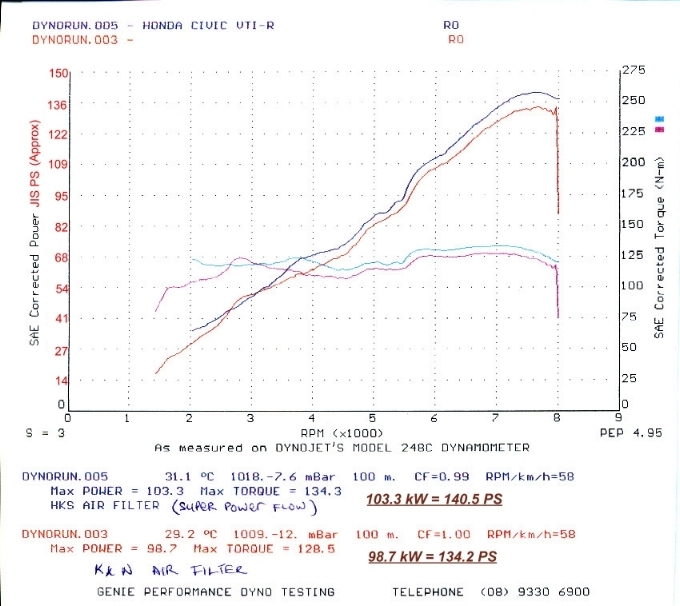 Zacka had initially wrote to TOVW's Front-Line some months ago to talk about his experience using the K&N drop-in replacement filter in his Civic VTi-R. Having been convinced of the importance of dyno-ing mods, Zacka recently wrote in again telling me of his recent change from K&N drop-in to a HKS Super-Power-Flow plus a Dynojet printout on the power gains from these two mods. Described in some detail in our K&N article elsewhere on the TOV, the K&N FilterCharger is a direct replacement of the stock Honda air-filter. Installing the mod simply means throwing out the stock filter element and dropping in the K&N in its place. The benefit of K&N as detailed in the article is the filtering element being of special construction gives better and more consistent air-flow thus contributing to power gains though the gains are relatively modest. 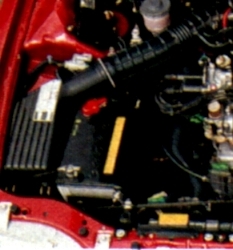 The HKS Super-Power-Flow is an open element design and should more accurately be described as a filter system. Described in detail in our HKS article elsewhere on the TOV, the SPF replaces the entire air-filter box, ie the plastic assembly in which the stock filter element is located. Installing the HKS SPF entails removing this box and putting the SPF assembly in its place. The SPF assembly consists of a foam filter element in a open 'mushroom' design. SPF comes as a complete kit with specific kits for each of Honda's model and type. Besides the assembly, the kit also contains all parts needed for installation and frequently a specially sized pipe to place the filter in the place originally occupied by the stock filter. One of the key importance of an open element filter such as the HKS Super-Power-Flow is the removal of the resonator box. This removes a huge source of air-intake restriction and will typically give good power gains. This means an open element air-filter system can be expected to outperform any drop-in aftermarket air-filters. The downside however is because the resonator box is no longer part of the air-intake system, the resonator's noise reduction effects are gone and the engine intake can become very loud. This occurs typically in the rather unfortunate 4000rpm region. 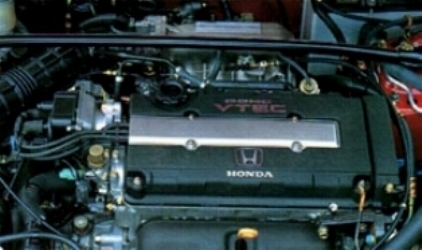 On DOHC VTEC'ed Hondas especially with the 4.400 ratio final drives, 4000rpm normally equates to around 110 to 120kph (70 - 75 mph) - smack in the middle of the expressway cruising speed ! The other effect is the much amplified intake roar when going full-throttle though for Honda engines and especially those equipped with VTEC, DOHC and SOHC included, this can be a very pleasant roar indeed. "With the paper filter, the best I got out of it was 98.4 kW @ 7600, and 127.7 Nm @ 7000. A quick changeover to the K&N, and I got the best of 98.7 kW @ 7750, and 128.5 Nm @ 6750.
curves, broadened and flattened the torque curve a bit too." The Dynojet chart supplied by Zacka. The original chart has power units in kW (metric system) but was converted to PS using a conversion of 1kW equal 1.36PS. While TOVW do not publish any subjective evaluation of aftermarket mods' effectiveness, we do want to direct attention to the consistent power gains of the HKS Super-Power-Flow all across the dynoed rpm range. Power gains across a wide power gain will not only benefit overall driveability (you gain improvements no matter which rpm you drive in), it will also have a very significant cumulative effect when performing full-throttle runs. Thus while the actual power gain at peak power is already quite large (6.3 ps for the HKS over the K&N), there is also a consistent 4-6ps gain from 3000rpm till the 8000rpm redline. So full throttle runs will see the HKS equipped car start gaining right from 3000rpm, and this gain will be accumulating all the way until 8000rpm so the final gain will be quite significant indeed. The reader is again reminded that the K&N FilterCharger is disadvantaged by limitations imposed by the resonator box. In return, intake noise levels of the K&N will be comparatively much lower than that from the HKS system, in fact quite near the stock levels. TOVW gratefully acknowledges Zacka Gerald Chan for his great dyno chart which is solely responsible for the successful publication of this article. Any opinions that may be implied here are solely TOVW's opinion. Dynojet results supplied by TOVW reader Zacka Gerald Chan.